Perhaps the biggest question mark on the effectiveness of implementation of the National Action Plan in nearly 3 years of its implementation confronted the State and society through the Faizabad sit-in. That the Punjab Government allowed such a protest to traverse the province freely and allowed it to make the capital hostage raises serious questions on the commitment of the Government towards the NAPand the ethos guiding it. Beyond Punjab, the manner in which the Federal Government ended the dharna with active corroboration by the Army, capitulated the State to the demands of a mob has all but isastrous connotations written all over it. Subsequent statements by the leader of the protest and actions, such as the DG Rangers distributing cash amongst dharna protesters, have not only raised serious questions about the support of the Army for the protest but the State’s ability to withstand mob pressures and effectively implement NAP. While this constituted as a flagrant violation across many NAP points, in particular it violated NAP point 3:Militant outfits and armed gangs will not be allowed to operate in the country as the protesters fought a pitched battle to push the might of State back in the operation. In the light of the above developments, this Monitor covers the fourth quarter of 2017. 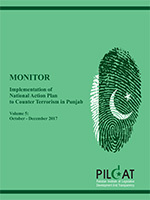 This Monitor uses the assessment of progress on implementation of NAP in the third quarter (July 2017- September 2017) as a baseline in order to report progress on NAP implementation during October to December 2017.